NOAA chief scientist was happy to go either way. Climatologist Bill Patzert of NASA’s Jet Propulsion Laboratory in La Cañada Flintridge blames a long-lasting weather pattern in the Pacific Ocean called the Pacific Decadal Oscillation. In the cycle’s negative phase, the surface waters of the western Pacific warm while the eastern Pacific cools, rather like a big La Niña that pushes the jet stream and the storms it carries to the north of California. The reverse ocean temperature pattern prevails when the oscillation is in the positive phase, producing wetter, El Niño-like conditions. For more than a decade, the oscillation has tended toward the negative. 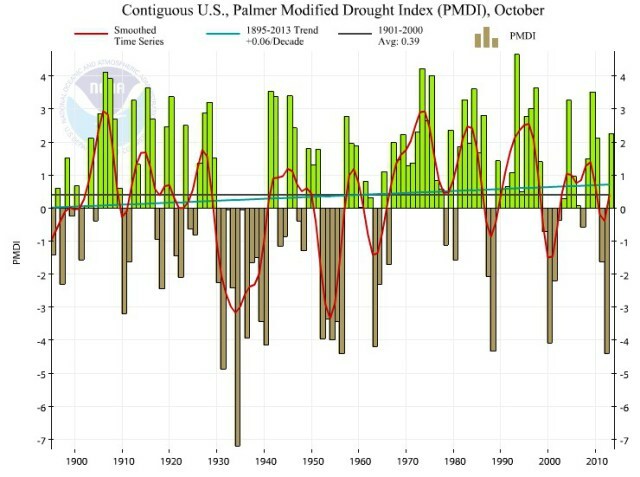 “Since 1997-98 more or less, we’ve been in a dry pattern” in the West, Patzert said. 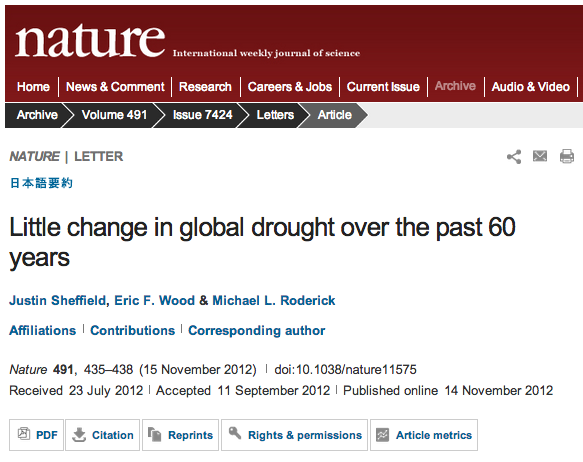 During the 1930′s and 1950′s, droughts were very common in the US, but they are becoming increasingly rare as CO2 increases. 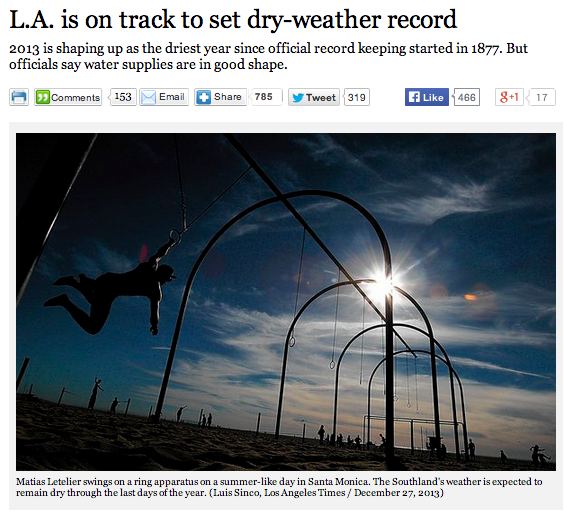 New government report from NOAA says 2012 summer drought NOT caused by global warming | Watts Up With That? Former ABC Chairman, and newly appointed chief business advisor to the Abbott Government, Maurice Newman, lays out the ugly cost of the Carbon (dioxide) Tax and the delusional green socialist agenda, implemented by the former Labor/Greens coalition. THE unprecedented cost of energy driven by the renewable energy target and the carbon tax had destroyed the nation’s competitiveness, Tony Abbott’s chief business adviser has declared. In an interview, Mr Newman said protection of climate change policies and the renewable energy industry by various state governments smacked of a “cover-up”. He said an upcoming review of the renewable energy target must include examination of claims made in federal parliament that millions of dollars were being paid to renewable energy projects that allegedly did not meet planning guidelines. Mr Newman’s comments follow those of Dow Chemicals chairman and chief executive Andrew Liveris, who said Australia was losing its natural advantage of abundant and cheap energy. “As far as new investments go, our primary energy sources of natural gas and electricity are now or will soon become negatives to any comparative calculation,” Mr Liveris said. “Average prices of electricity have doubled in most states in recent years and the unprecedented contraction in consumption threatens a ‘death spiral’ in which falling consumption pushes up prices even further, causing further falls in consumption,” he said. Mr Newman said Australia had become “hostage to climate-change madness”. “And for all the propaganda about ‘green employment’, Australia seems to be living the European experience, where, for every ‘green’ job created, two to three jobs are lost in the real economy,” he said. Mr Newman said the climate change establishment, through the Intergovernmental Panel on Climate Change, remained “intent on exploiting the masses and extracting more money”. Senator Madigan said the issuing of renewable energy certificates to one of the non-compliant wind farms, at Waubra in Victoria, reflected “a culture of noncompliance arising from systematic regulatory failure that impacts every wind farm in Victoria”. He said the issue involved “the pain and suffering of little people living in rural Australia, environmental damage, fraud on a grand scale, deception, lies and concealment“. Warmist scientists and reporters waiting for rescue after trying the same trick a century later. In landing cargo on Antarctic shores, advantage is generally taken of the floe-ice on to which the materials can be unloaded and at once sledged away to their destination. Here, on the other hand, there was open water, too shallow for the `Aurora’ to be moored alongside the ice-foot…. The day had been perfect, vibrant with summer and life, but towards evening a chill breeze sprang up, and we in the motor-launch had to beat against it. By the time we had reached the head of the harbour, Hoadley had several fingers frost-bitten and all were feeling the cold, for we were wearing light garments in anticipation of fine weather. 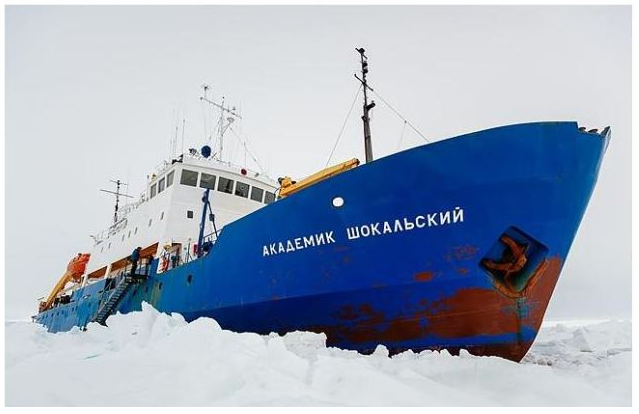 Life has taken a turn for the worse since Christmas Day, when gusts of up to 70mph slammed into the hull of the MV Akademik Shokalskiy and snow circled its decks, making it impossible to stand up straight outside. We were only two nautical miles from the ocean before Christmas, but that distance has now swelled to around 20 nautical miles as the blizzards and winds have continued. If the joint efforts of the Aurora Australis and Xue Long don’t work, the only other option will be to evacuate the ship by air, though this would be the absolute worst case scenario. 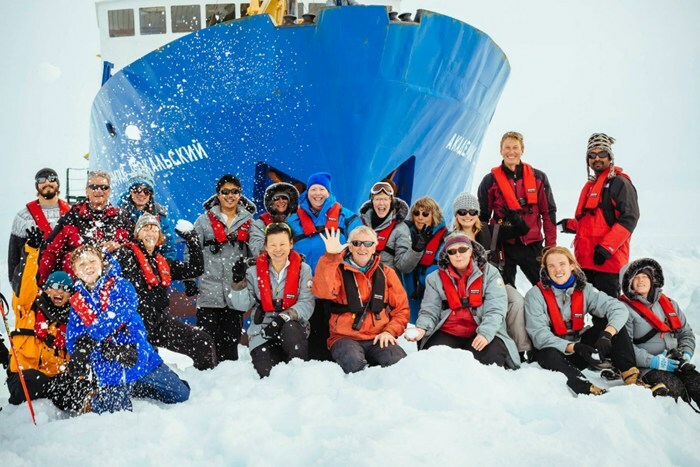 I am with the Australasian Antarctic Expedition, led by climate scientist Chris Turney of the University of New South Wales. We are following a century-old expedition led by the British-Australian Antarctic explorer Douglas Mawson, who landed in Commonwealth Bay in January 1912. We – a group of scientists and paying members of the public acting as science assistants – plan to repeat many of Mawson’s scientific measurements in order to understand how this pristine landscape has changed over the past 100 years. Here’s how it’s changed, boys. There is more ice. 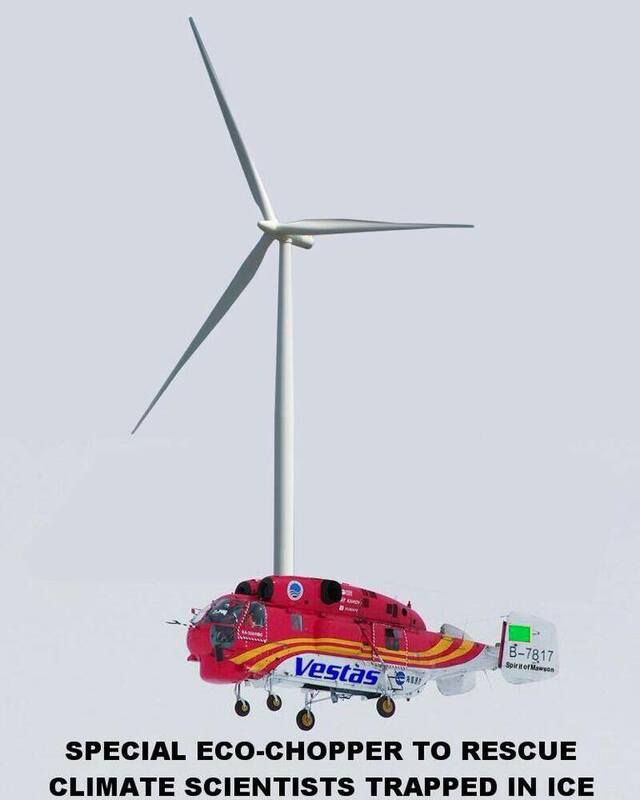 I wonder what their carbon footprint will be if they are all lifted off by helicopter. Quite high I presume, if we use their own typically exaggerated measurements. With that in mind it seems only reasonable to hold them accountable with their own standards and leave them there. That way they could also accurately recreate Mawson’s voyage by sitting there for a year and waiting for the ice to melt. I predict a Lord of the Flies type scenario unfolding. NOTE: The Aurora made it into Commonwealth Bay in three successive summers to land and pick up members of Mawson’s expedition. Sea ice is disappearing due to climate change, but here ice is building up. Q: Dr Adam Rutherford: The fact that it’s expanding, that – that sounds counter-intuitive, when we talk about the polar ice caps melting, as a result of global warming. A: Prof Chris Turney: Yeah, well, it’s a fascinating thing, isn’t it, really. Ultimately, global warming covers a vast array of different responses by our planet. And one of the fascinating things that we’re seeing is suggestions that large parts of the oceans off East Antarctica are actually getting fresher. And yet you’ve got this expanding sea ice, and one of the ideas we’re testing out here is this idea that when you’re melting the sea ice around the East Antarctic coastal fringes, at depth – not from air temperature but from warmer oceans – what you’re doing is you’re putting that fresh water from the Antarctic ice sheets into the oceans. It’s lighter, it’s less dense than salt water, so it floats to the surface relatively, and then it’s more vulnerable to freezing. And hence you get an expansion of sea ice cover. So that’s one idea that we’re testing at the moment. Like I said. It’s pathological. Via Andrew Bolt – Herald Sun – Aarmists trapped by irony off Antarctica. glaciologists aboard the Shokalskiy think the ship might have become inadvertently caught in the formation of a new area of fast ice, which could stay in place for several years. Antarctic sea ice area is the highest on record for the date, up 20% since the 1970′s. Why have the ABC and Fairfax media, so keen at first to announce this expedition was to measure the extent and effects of global warming, since omitted that fact from their reports after the expedition became ice-bound? There was only one news story out of 41 that mentioned climate change. That was CBS “This Morning” Dec. 30. “Despite being frozen at a standstill, the team’s research on climate change and Antarctic wildlife is moving forward,” CBS News Correspondent Don Dahler said. This really has been a PR debacle of amazing proportions. The ship stuck in ice has captured something larger than I would have expected. Methinks the timing must be apropos. Good scientists are distancing themselves from the publicity hungry climate lightweights and commentators on both sides of the fence are agreeing in their criticism. A third effect we are barely starting to see may ripple on for months — that’s when mass-media victims realize that the “Russian Tourist ship” was really a boat load of Australian and New Zealander scientists, paid for mostly by taxpayers and loaded and advised by supposedly “expert” climate scientists. This misinformation was despite the boat having BBC, and Guardian media on board, and Fairfax press in one of the rescue icebreakers. Today I see evidence of the first two effects. TOP READ : The Antarctic ‘research’ fiasco – ‘would you, could you, in a boat’? | Watts Up With That? And now, a Guardian global warming reporter says that the Antarctic summer is too cold for humans. 97% of skeptics believe that the climate consensus consists of complete morons.